1. Go on a Road Trip! With the expensive cost of flights, it’s easy to think we have to avoid traveling, but a road trip may be just the fun idea to mix things up. Drive to a new city or visit friends in a nearby state all while taking in the sites along the way. I’m hoping to take a road trip across northern California in 2015. Please do share with me your off-the-beaten-path suggestions for Northern Cal in the comments. I’m taking tips on fab boutiques, travel worthy restaurants, and amazing natural landscapes in the San Jose – Sacramento – San Fransisco – Napa area! 2. Take a visit to luxurious hot springs, perfect for the icy winter and beyond! Why oh why didn’t I ever visit the library before now! Well, because it’s the library, but I was pleasantly surprised time and again in 2014 during my visits. I have found the best books on business development, art techniques, and fantastic recipes for starters. Some of the books I’ve come across at the library I even plan to purchase this year just because I liked them so much. So, try before you buy…at the library. Not to mention, if you have any new ventures you’ll be starting in 2015, there is sure to be a book at the library to give you the edge you need in your pursuit. I recently found a ton of great books on entrepreneurship, finances, and attracting investors. And not to forget, you can rent DVDs at the library, too! 4. Check out the consignment stores in your neighborhood! Consignment stores are the best! If you’ve never been to a consignment store before, here’s how it works. Consignment stores resale gently used clothing, often of the designer and luxury variety. You can both buy and sell there, so the new year is as good a time as any to clean out your closet and consign the items that you just aren’t wearing anymore. Some consignment stores will pay you cash for your clothing items immediately, while others will mail you a check when your items sell, either way it’s money in the bank for the new year! Here are a few of my favorite consignment stores! Check back for my post on tips for successful consigning and consignment shopping. You’ll want to read this! 5. Redecorate a space in your home. 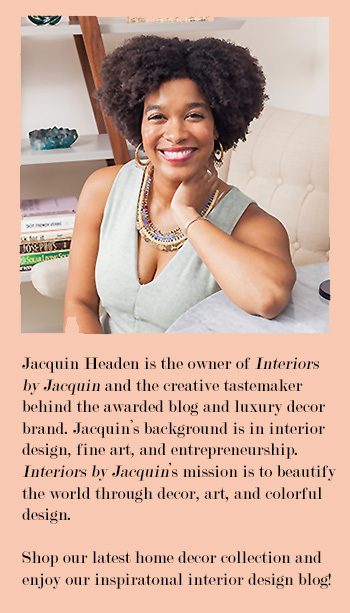 With Interiors by Jacquin being your one-stop-shop for home decor tips and design inspiration, it should be no surprise that I’m recommending redecorating a room in your home for the new year. Don’t undervalue the impact of a room refresher with new, colorful home decor accessories! If you’re looking for someone to add that professional touch, then consider my e-design services this year. 6. Try a new ethnic food at home or at a new restaurant. Here are 2 recipes to get you started! One takes you to Africa and the other to Asia — Senegalese Peanut Soup and Crab Wontons with Sweet & Sour Sauce. 7. Give yourself a spa day at home! More to come on my best tips for giving yourself a relaxing spa day at home. I bet you’ll want to invite a friend to enjoy the luxurious home spa experience I have in mind. 8. It may be winter, but buy some fresh flowers to brighten up your home! Last month we discussed the importance of introducing natural beauty into your home. If you didn’t do this enough in 2014, now is your chance. See 5 Great Ways to Add Color to Your Home on tips for adding color to your space with plants and flowers. 9. Throw a fun dinner party for friends in 2015! Did you miss out on “Friends-giving” in 2014? I have a new blog post in the works on how you can throw a dinner party for friends with style and ease! (and a menu worth inviting people over for!) Stay tuned! 10. Perform a Random-Act-of-Kindness — your friends and family will thank you. Nothing feels better than the thanks you get when you help a friend unexpectedly or surprise someone with a thoughtful gift. Build up positive energy in 2015! 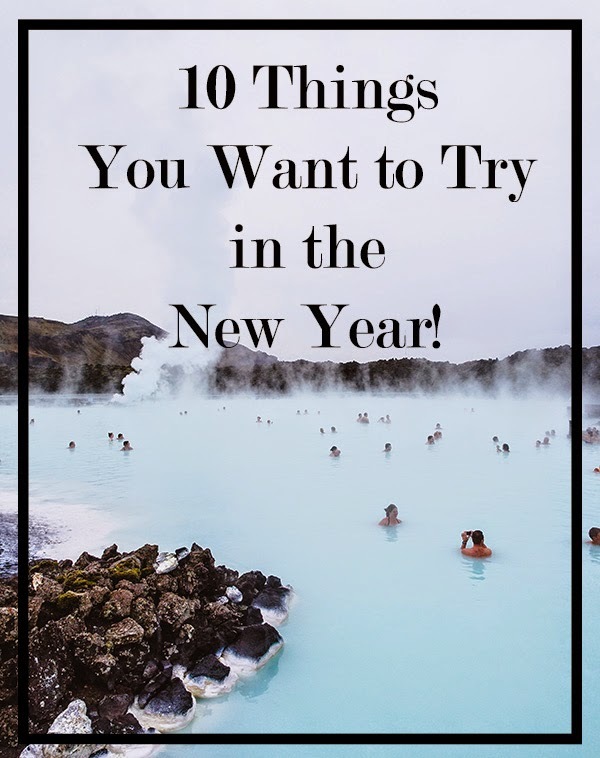 What do you plan to try in the new year?